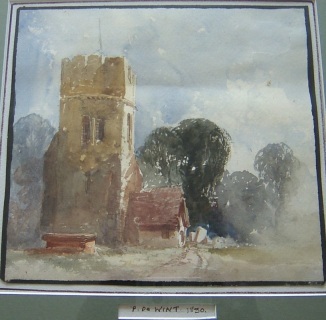 Watercolour of Church ...probably Lincolnshire. "Taken from an old Peter De Wint Sketchbook"
There is a tear in the sky area top right. I have shown this watercolour to the local auction house. They consider it to be 'probably by Peter de Wint". In 1806 he visited Lincoln for the first time, with the painter of historical subjects William Hilton, R.A., whose sister Harriet he married in 1810. De Wint and Hilton lived together in Broad Street, Golden Square, where John Varley lived. Varley gave De Wint lessons and introduced him to Dr Monro, who ran an informal academy for young artists. De Wint first exhibited at the Royal Academy in 1807, and the following year at the Gallery of Associated Artists in Watercolours. In 1809 entered the Royal Academy schools. He was elected an Associate of the Old Watercolour Society in 1810 and was made a full member the following year. By that time, as an established drawing-master, he was spending his summers teaching well-to-do provincial families. In 1812 he became a member of the Society of Painters in Watercolours, where he exhibited for many years, as well as at the Academy. De Wint's life was devoted to art; he painted admirably in oils, and he ranks as one of the chief English watercolorists. "No artist", asserted Alfred William Rich, "ever came nearer painting a perfect picture than did Peter de Wint". He frequently visited his wife's home city of Lincoln, and many of his panoramic landscapes and haymaking scenes are set in Lincolnshire. He occasionally toured in Wales, and in 1828 travelled to Normandy.